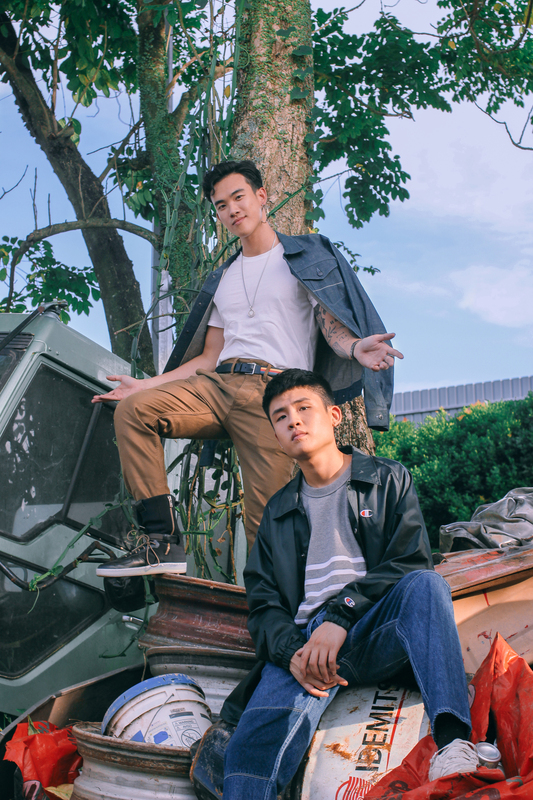 Here's one for the annals of Singaporean pop music: B4NGER PROJECT, the joint album by Gentle Bones and MYRNE, two of the country's brightest musical prospects. MYRNE – aka Manfred Lim – and Gentle Bones – aka Joel Tan – met years ago over the internet, with MYRNE remixing a few Gentle Bones songs and Gentle Bones asking him for advice and opinions on his songs. It was only last March that both of them started working on what would become B4NGER PROJECT. This album is an exciting left-turn for both musician's careers: for Gentle Bones, it marks a proper move into more synthetic, electronic pop territory, and for MYRNE, a turn away from the more high octane EDM he's been making his name in. This isn't an album destined to remain embraced only by fans of both musicians, though – this is hooky, polished pop music, made with attention to detail but not a whole lot of self-seriousness, that should beckon lots of new listeners into the fold. We recently sat down with Gentle Bones and MYRNE for a chat about B4NGER PROJECT: how it was made, what it is about and who it's for. Read the interview below and stream the album after. Manfred, you said before that you started working together because you were bored of the music coming out of your respective circles. What were you dissatisfied with? Manfred Lim: The music genres that I produce are like trap, future bass. Stuff like Martin Garrix, The Chainsmokers now. But back then, like three years ago, that stuff was already coming out, and it was already getting very saturated. I didn't like it ‘cause a lot of EDM vocals are just very anthemic, just like there's a buildup, then a drop, then there's a downpart, and there's another build-up. It's very formulaic. With all the remixes with Joel’s stuff, I always tried to do a different approach, then after that I just thought, "Yeah, why not – let's just write something original together." Joel, were you bored of the music coming out of your circle, in the same way Manfred was? Joel Tan: Oh yeah, definitely. Like for me, I've always been jumping around on different sounds so I think when I finally approached him, we actually didn't know what we actually wanted to do quite yet. We just knew we wanted to do something completely different from what we had already. So I had my R&B, post-R&B kind of sound, and then he had his music. So then we just decided to go completely opposite and almost – I won't call it pop or commercial. It's just really stuff that we were familiar with, and yet simple. That kind of restriction allowed us to exceed all of our expectations from there, so we thought that was a good way to start working. When you said you wanted to go the complete opposite direction, what was that process like? Were you like, "I would never do this in my normal music, so let's go right there”? Joel: Yeah, maybe. What was it like for you? At least for me it was definitely like: he could do a lot of things outside of what he is doing already, so I was like "Just try la, just try some stuff." And then 'JU1Y' came about. Manfred: A lot of common threads are just the hooks, which are quite poppy, then in traditional pop music the instrumental's pretty simple, or it's the full-piece band, with just guitar and some rhythmic elements. But for us, we just wanted to really focus more on the production side of things and make it really interesting, really diverse and comprehensive, as if production and vocals are on the same level, as compared to traditional pop music. If you list the top Billboard-charting songs from 2012, no one can tell you who the producer is cause they're always behind the scenes when they're working at the, command of the vocalist. Like the vocalist would say "I don't want any instruments here", stuff like that. So every track was produced together. He was sitting there and he was telling me "I think this part you could do a bit more" and we'll go back and forth. So you spent a lot of time together over this past year? Joel: Yeah, quite a bit of time, for that whole stretch of one year. I think the interesting part of working with him is that, like, I think the way we approached it was very different from how at least, I think, I used to approach it where I would write my songs and then get a producer on board to put the finishing touches onto it. But with us, because of how we realised how music is growing now, we approached it in a way where it was constant: there was constant writing in terms of writing for the vocals, and writing for the production. It was just constant back and forth: I'd come back to him with vocals, and then he'd edit the tracks. So we were just constantly building together, rather than separately, which in my opinion, made it very special la. Was there any weirdness or vulnerability in that? ‘Cause you're bouncing ideas off each other and they might be half-formed. Was that different for both of you? Manfred: I think we're experts in both our spaces. So I don't know anything about lyrical writing, so like, all the songwriting, all the direction, he'll write it, and then I'll listen to the mood and the feel of the vocals and then I'll craft a beat around it so there's enough space. So it's literally like, every single track is made for that vocal – not in the big pop world, where one big producer will send this really good instrumental to like five different pop vocalists, and the best hook will get it, y'know? So for us this was very individual, very specialised. Joel, was having someone really shape the music around your vocals different from working with the people you've collaborated with in the past? Joel: I would say it was quite vastly different, ‘cause with him, as with every song, there is not just production involved, but there's also mixing and mastering and getting all the sounds right. With my older songs, I would send them overseas, to professional mixers to mix the songs; but in this case, he did everything in his room. We did everything in his room. So the possibilities were really quite endless. It was a lot of me trusting him, ‘cause I used to have several people do that one job, and this guy is doing it all on his own. So it was nice, a lot of free space, and just endless possibilities, the way we approached it. Manfred: Like, every final master, I'd send it to him, and then he'd give me little nudges, which you can't do when you're paying a mixing engineer like $10k to mix your track. So it was all really minute details, like he would tell me, “Put my vocals a bit louder here”. It was something I wouldn't even notice in the first place, cause I'm focused on making the whole song sound similar. So besides both of you, who is this album for? Who do you hope listens to it? Was there anyone you had in mind when you were making it, or writing your lyrics? Joel: It started off with 'JU1Y'. So when we did 'JU1Y', we actually did two songs, and that set the groundwork for the theme we wanted to go for, I think. It’s just mostly based off life experiences, the girls we've met. Yeah, just very simple stuff – I don't know, how would you put it? Manfred: Half of the time we spent together, we would write music or we just chill at the coffee shop and talk about life, relationships, music in Singapore. For me, the production parts of the album were just really for Singapore – just to show you don't need a big studio, or you don't need to fly to some Scandinavian country to write an album. I know a lot of young kids want to get into producing, 'cause I play shows in Singapore and they all come – it's always the same faces. I'm sure they have the same dreams, but they always think "I don't have enough time, I don't have enough money for fancy equipment." But then I have neither of that too: like, I'm schooling full-time. I use one pair of headphones, and I just really wanted to show that it's possible in this city to do something. How would you characterise the tone of the album? There seems to be this sense of humour to it. Would you agree with that? Joel: I wrote most of the songs very much based off like – I didn't want to take it too seriously, I don't wanna convey any sort of message or meaning. It's almost like a diary in each song, like a journal log for every song we do. No filter, just a lot of honesty, and a lot of self-deprecation, maybe. I don't know, when I wrote this album a lot of what I got was love for myself after hating myself, which was nice. Manfred: I just hate myself, so I don't know how that feels. You said there were also a bunch of other songs that didn't make it to the album, so are you guys planning to return to those at some point? This your first project together as a duo, but are you planning to continue? Joel: Uh, yeah, if we do continue we'll probably just write new songs, I think. ‘Cause I think our approach is we run through songs quite quickly and we kind of know which ones we want to keep and which ones we don't want to keep. When we start newer songs with a fresh perspective it's always better, so we tend to just move on la. Probably write new stuff, we'll try to write singles ahead after this album maybe. Do you guys have any last thoughts, anything I didn't ask you about that you want to mention?